So we’re quickly going through the NFL season, Bye weeks are done and every team has four games remaining in the 2016 NFL season. This is when the playoff races in both conferences intensify, which can also make it more difficult to place the correct wagers on games. The upcoming “Thursday Night Football” contest will likely determine the winner of the AFC West. The Kansas City Chiefs host the Oakland Raiders with first place in the division on the line. Oakland has a one-game lead over Kansas City, but the Chiefs are a perfect 3-0 against divisional opponents. The Raiders’ only loss within the AFC West came at the hands of the Chiefs in Week 6, and another head-to-head win for Kansas City would give them sole possession of first place. The betting line indicates that the two rivals are even on a neutral field, but the Chiefs might have a slight advantage. Oakland has the AFC’s No. 1 ranked offense, and it’s had its way with virtually every opponent. Kansas City. Aside from Kansas City’s visit, the Raiders are averaging 33 points per game at the Oakland Coliseum, with Carr throwing nine touchdown passeand just two interceptions. That, however, did not stop the Chiefs from holding Oakland to 10 points on Oct. 16 as Carr was held to just 225 passing yards, one score and a pick. On Thursday, the Chiefs look to have a repeat performance in Kansas City, where opposing offenses haven’t had much of any success. The Chiefs have gone 4-1 at home, holding opposing teams to 16.8 points per contest. Kansas City allowed a season-high 27 points to the San Diego Chargers at Arrowhead Stadium in the season opener, but the Chiefs got the win in overtime. The over/under for Thursday’s game is 47. The Raiders and Chiefs are not only the best teams in the AFC West, but they are making the case to be known as the best teams in the conference. Oakland is tied with the New England Patriots for the best record in the AFC, and Kansas City might be the biggest threat to New England’s Super Bowl chances. The Patriots remain the favorites in the conference to reach Super Bowl LI. With both teams coming off big wins Sunday, the Chiefs are three-point home favorites at Las Vegas and online sportsbooks. Oakland defeated the Buffalo Bills by two touchdowns, and Kansas City got a road victory against the NFC South-leading Atlanta Falcons. Here are some early Week 14 NFL betting lines. 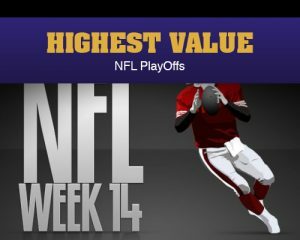 Get the highest betting value on the NFL Playoffs, sign up at regalpoker.com.